What is the Malaysian eCommerce market size in 2015? It has been a while since we wrote about figures, so this week we are going to touch on total e-commerce transaction volume in Malaysia, backed by some latest insights from local industry leaders. Before that, let's take a look at some "older" data available earlier. In 2011, Nielsen & PayPal was forecasting online commerce market size in Malaysia to be RM5.76 billion in year 2015, both products and services (travel, ticketing etc) included. If you refer to the chart above, Euromonitor on another hand did a forecast of RM1.58 billion (physical products only) of total e-commerce transactions in year 2015. More recently, UBS estimated total retail sales in Malaysia to be US$98.2 billion, and eCommerce % of retail at 0.2%. This translates into US$196 million of eCommerce market size, equivalent to RM718 million in year 2013. At 0.2% e-commerce penetration rate and RM718 million online transactions, this estimate is quite conservative, even for year 2013. Besides research agencies, perhaps online payment gateway companies are the best source of reference on e-commerce transaction volume. As recent as last week, iPay88 has revealed some key indicators in a report by Sin Chew. It was covered in Chinese as you can read below, which we will summarize in English right after this. With the indicators above, total e-commerce market size can be derived to RM200 million / month, and RM2.4 billion in year 2015. 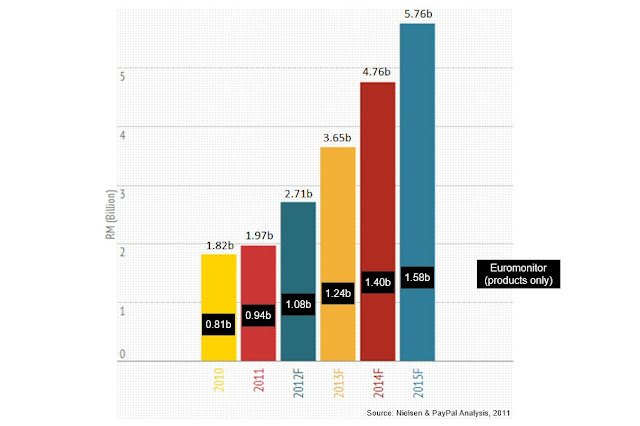 However, it is less than half of RM5.76 billion forecast by Nielsen-PayPal. On top of that, there are easily a couple of local e-commerce sites are registering more than RM100 million sales a year by just selling products only, not to mention services and ticketing sites. So, how big really is our e-commerce market size right now? 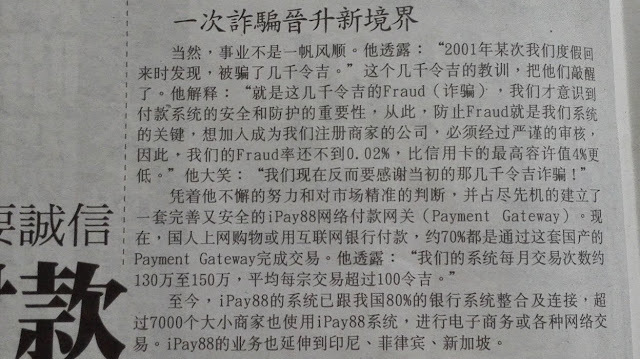 We ask Eng Sheng Guan, CEO of MOLPay for his opinion. "There are many international corporations operating in Malaysia are still using bank or regional payment provider solution for transactions, in which local third party payment providers have yet to penetrate. Therefore, I would estimate the existing Malaysia e-commerce market size is more than US$2 billion", Eng predicts. That is more than RM7 billion! If we estimate physical-products-only it will be around RM2 billion (~30% of total transactions). What do Malaysians buy online? Let's refer to a recent study published by Insights by Google Malaysia. 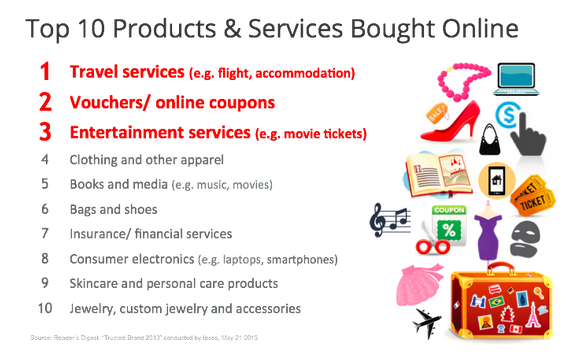 As expected, travel services (flights, accommodation) tops the list, followed by vouchers and entertainment services (movie tickets). Fashion items on another hand, is leading the physical products segment, followed by consumer electronics and beauty products. It is also being revealed in the same report that there are around 7 million Malaysians who purchase products online monthly. 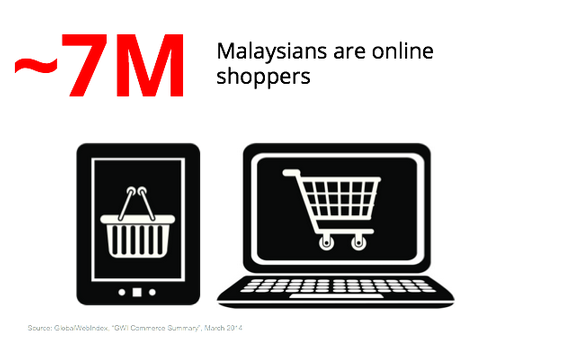 Trend Micro on another hand revealed that 8 out of 10 Malaysians online users now shop online. We reported 9 out of 10 back in December 2013.
ecInsider: What is the Malaysian eCommerce market size in 2015?